The Holy Fire spreads in Lake Elsinore, California, the U.S.
"It feels like a war zone," Ana Tran told the Los Angeles Times as ash and flame retardant fell on her neighborhood. The fire, which was five percent contained, was being fueled by dry brush covering steep terrain and stoked by erratic wind gusts during the night, said Thanh Nguyen, a spokesman for the incident said. "Strong down drafts is making the fire move aggressively downhill," said Nguyen, noting that firefighters were working to build barriers and containment lines to protect more than 2,000 homes at risk from the fire. Three firefighters suffered minor injuries battling the relatively small blaze that consumed more than 10,200 acres (4,128 hectares) since it began on Tuesday, fire officials said. 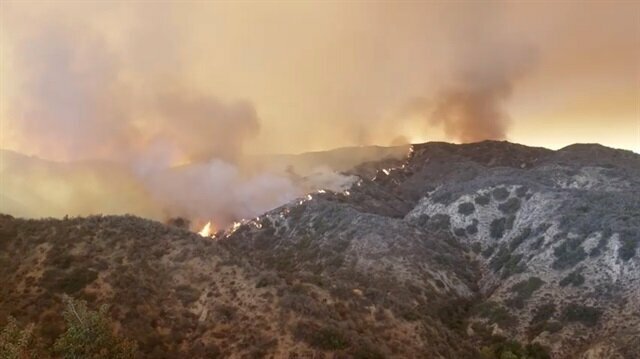 The Holy Fire was one of several fires burning in California that have displaced tens of thousands of people. Wildfires across the state and region could be further stoked by strong gusts, low humidity and hot weather on Friday and Saturday, forecasters warned. In Northern California, a mechanic helping to fight the Carr Fire burning around Redding was killed in a traffic collision on Thursday, bringing the death toll from that blaze to eight, the California Department of Forestry and Fire Protection (CalFire) said. The 178,000-acre Carr Fire has killed two other firefighters along with three members of one family and has destroyed nearly 1,100 homes. It was 49 percent contained with firefighters struggling in steep terrain to control the blaze, CalFire said. More than 4,000 firefighters are battling the Mendocino Complex Fire, which has burned 305,200 acres in three counties north of San Francisco, CalFire said. Two firefighters were injured and 119 homes destroyed by that fire which now ranks as the largest fire on record in the state. The Mendocino Complex became the largest wildfire in Californian history on Monday as it raged at the southern tip of the Mendocino National Forest where crews battled to keep flames from descending into foothill communities.The Mendocino Complex Fire, made up of two separate conflagrations that merged, grew to 283,800 acres (114,800 hectares) and was still growing, California Department of Forestry and Fire Protection said.The fire surpassed the Thomas Fire, which burned 281,893 acres in Santa Barbara and Ventura counties in 2017, as prime weather conditions are expected to persist.California wildfires claim seventh victim, still spreading"Unfortunately, they're not going to get a break anytime soon," National Weather Service meteorologist Brian Hurley said of firefighters who had cut buffer lines around 30 percent of the blaze. "It's pretty doggone hot and dry, and it's going to stay that way. "Hurley said temperatures could reach 110 degrees (43 Celsius) in Northern California over the next few days with gusty winds fanning the flames.The Mendocino Complex, which has destroyed 75 homes and forced thousands to flee, is the largest of eight major wildfires burning out of control across California, prompting U.S. President Donald Trump to declare a "major disaster" in the state.Strong winds continue to fuel California wildfiresA total of nearly 3,900 people were fighting the Mendocino Complex Fire, including crews from Arizona, Washington and Alaska.Some 200 soldiers from the 14th Brigade Engineer Battalion at Joint Base Lewis-McChord near Tacoma, Washington, have also been called in to help in one of the most destructive fire seasons on record.On Sunday, 140 fire managers and specialists from Australia and New Zealand underwent special training and were issued safety gear at the National Interagency Fire Center in Boise before being deployed to fires in the Pacific Northwest and California.Extreme conditions expected as firefighters battle California blazesCrews battling the Mendocino Complex on Monday were focusing on keeping flames from breaking through fire lines on a ridge above the foothill communities of Nice, Lucerne, Glen Haven, and Clearlake Oaks, said Tricia Austin, a spokeswoman for Cal Fire. "If it were to be carried outside of those lines they have on the ridge, it could sweep down into those communities, that's what we're trying to prevent," she said.Elsewhere in California, evacuations were ordered for cabins in Cleveland National Forest canyons in Orange County on Monday afternoon after a blaze broke out and quickly spread to blacken some 700 acres (283 hectares).Trump declares California wildfires as 'major emergency'The Carr Fire - which has torched 163,207 acres (66,047.5 hectares) in the scenic Shasta-Trinity region north of Sacramento since breaking out on July 23 - was 45 percent contained.The Carr Fire has been blamed for seven deaths, including a 21-year-old apprentice PG&E lineman Jay Ayeta, whom the company said on Sunday was killed in a vehicle crash as he worked with crews in dangerous terrain.Heat, winds pose enduring menace to burning Northern California"California wildfires are being magnified & made so much worse by the bad environmental laws which aren't allowing massive amount of readily available water to be properly utilized," Trump wrote on Twitter.A California Department of Forestry and Fire Protection spokesman declined to comment on Trump's tweet but said crews did not lack water to fight the flames.Environmental activists and some politicians say the intensity of the state's wildfire season could be linked in part to climate change. A seventh person died in a northern California wildfire on Saturday, as a couple of other fast-growing wildfires in the state expanded by more than 25 percent overnight and continued to spread.The White House announced on Sunday morning that U.S. President Donald Trump declared that a major disaster exists in California, a move that makes it easier for residents, businesses, cities and counties to gain access to federal money, food aid and other programs. "Assistance can include grants for temporary housing and home repairs, low-cost loans to cover uninsured property loses and other programs to help individuals and business owners recover from the effects of the disaster," the White House said.More residents were ordered to evacuate their homes this weekend as weary firefighters endured high temperatures and gusting winds.The Carr fire, about 162 miles (261 km) north of Sacramento, claimed the life of a power company lineman Saturday, according to a CBS affiliate, citing a spokesman for the PG&E Corporation. Neither a spokesman with the electric company nor fire officials were immediately available for comment.The fire, one of the most destructive in California history, had already killed six people, including a great-grandmother and two children, and a firefighter and bulldozer operator.Two other blazes collectively called the Mendocino Complex burned in Mendocino, Lake and Colusa counties, about 90 miles north of San Francisco. The River and Ranch fires had grown to cover a total of 229,000 acres (92,600 hectares) by late Saturday, and were considered 32 percent contained.This year, California wildfires have burned more land earlier in the "fire season" than usual, said Ken Pimlott, Cal Fire director, during a news conference on Saturday. "Fire season is really just beginning. What seems like we should be in the peak of fire season, historically, is really now the kind of conditions we're seeing really at the beginning," said Pimlott.California Governor Jerry Brown, who visited some of the burned areas on Saturday, said, "This is part of a trend, the new normal, that we've got to deal with. "Through last week, California fires had torched about 290,000 acres (117,300 hectares), more than double the five-year average over that same period, according to Cal Fire.The Mendocino Complex fires cover more than two-thirds the size of sprawling Los Angeles. They have forced the evacuation of more than 20,000 residents and destroyed more than 100 structures.More evacuations were ordered on Saturday afternoon, but no estimate of people involved was released.Firefighters had managed to contain 41 percent of the Carr blaze by Saturday evening, and authorities were allowing some evacuees to return.Both areas remained under a "red flag warning" issued by the National Weather Service for strong winds, low relative humidity and temperatures topping 90 degrees Fahrenheit (32 degrees Celsius), all conditions that can drive the growth of wildfires.So far this year, U.S. fires have burned 5 million acres (2 million hectares), much more than the 10-year average, according to the National Interagency Fire Center.Three men were given citations on Saturday for refusing to leave an area where firefighters wanted a tanker plane to make an air drop, causing the plane to be diverted, according to a post on the Lake County Sheriff Office's Facebook page. The men were watering their marijuana plants, police said.